Smith's first television role was as Jim Taylor in the BBC adaptations of the Sally Lockhart quartet books The Ruby in the Smoke and The Shadow in the North. His first major television role came in the television series Party Animals, a BBC television drama series about fictional parliamentary advisors and researchers in Westminster. In Party Animals, Smith portrays Danny Foster, a parliamentary researcher to Jo Porter (Raquel Cassidy), a Labour politician and junior Home Office minister. At 26 years old, Danny is described as an intelligent but timid "politics geek" who should have moved on from researching at his age. His brother, Scott, a public affairs consultant, is played by Andrew Buchan.Within the series' narrative, he attempts to balance his affections for Kirsty MacKenzie (Andrea Riseborough), his intern, while trying to prevent Porter's imminent decline. In an interview in 2007, Smith discussed his character's motivations. He summarised Danny as having a romantic outlook of the political world while being cynical elsewhere. The character was drawn into politics by his father and his own political drive. He defended his character's age by characterising him as being loyal to Porter, instead of being incompetent. He talked about his character's emotional and intellectual maturity: emotionally, he lacks confidence around women—most notably seen with his unrequited love towards Kirsty—but Smith portrays Danny as a caring and sensitive but "wry, sarcastic, [and] witty" romantic; and intellectually, Danny is portrayed as attentive and possessing a strong work ethic. 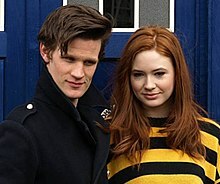 Smith with Karen Gillan promoting Series 5 of Doctor Who in March 2010. Smith was revealed as the Eleventh Doctor in the British science-fiction television series Doctor Who in January 2009 to replace David Tennant, who announced his departure in October 2008. Smith was a relatively unknown actor compared to the actors then speculated about possibly taking on the role, who included Paterson Joseph, David Morrissey, Sean Pertwee, James Nesbitt, Russell Tovey, Catherine Zeta-Jones, Chiwetel Ejiofor, Robert Carlyle, and Billie Piper. 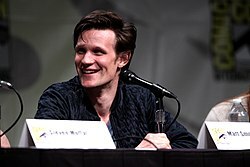 Smith was first named as a possible successor less than a day before he was announced as the Eleventh Doctor, on edition of 3 January 2009 of BBC Breakfast, among the names speculated about. His obscurity prompted the news headline "Doctor Who? ", a riff on the show's title. Smith was one of the earliest actors to audition for the role, performing on the first day. The production team, consisting of the incoming producer, Steven Moffat, and BBC Wales Head of Drama and executive producer, Piers Wenger, immediately singled him out based on his performance. Smith additionally auditioned for the role of John Watson in the Moffat-created Sherlock, undergoing auditions at the same time; he was unsuccessful, as Moffat believed his eccentric acting style was closer to Holmes, whose role had already been given to Benedict Cumberbatch. At 26 years old, Smith was three years younger than Peter Davison was at the time of his casting as the Doctor in 1981, and younger than any other actor suggested for the role. After three weeks of auditions, Moffat and Wenger agreed that it had "always been Matt" and approached him to accept the role. Smith speaking at the San Diego Comic-Con International in July 2012. The BBC were cautious about casting him because they felt that a 26-year-old could not play the Doctor adequately; Wenger shared the same sentiment but thought Smith had proven his acting quality in Party Animals, which Wenger thought highlighted Smith's "mercurial qualities". Some fans of the show believed that Smith was inexperienced and too young for the role, while others supported him by citing his demonstrated acting ability. For his performance in his first series, he was nominated in the Outstanding Drama Performance Category of the National Television Awards. Smith is the first Doctor to be nominated for a BAFTA for Best Actor. Smith has said of his character: "The Doctor is excited and fascinated by the tiniest of things. By everything. By every single thing. That's what's wonderful about him as a character. It's why children like him, I think. Because he doesn't dismiss anything. He's not cynical. He's open to every single facet of the universe." In June 2010, Smith appeared on stage with Orbital, and performed with them a version of the Doctor Who theme, at the Glastonbury Festival. Smith hosted the Doctor Who Prom at the Royal Albert Hall on 24–25 July 2010. On the morning of 26 May 2012, Smith carried the Olympic torch in Cardiff, an activity which was noted by Doctor Who fans for its resemblance to a 2006 episode of the show in which the Doctor carried the torch. On 1 June 2013, the BBC announced that Smith would be leaving Doctor Who at the end of the 2013 Christmas special. Upon reflecting on his decision to leave in a 2016 interview, Smith expressed regret for not staying longer, owing to wanting to work longer with co-star Jenna Coleman. In 2018, while appearing on Desert Island Discs, Smith revealed that he nearly turned down the role of the Doctor. In June 2015, Smith was cast to portray Prince Philip, Duke of Edinburgh, in the Netflix royal drama The Crown. Smith played the role for the series' first two seasons, as the role would be recast every two seasons. Smith was cast in the 2008 black comedy In Bruges, as the younger version of Ralph Fiennes’s character, however his scenes did not appear in the final cut of the film. He starred in the 2009 short film Together and the 2010 film Womb. In February 2013, it was reported that Smith had signed up to appear in Ryan Gosling's directorial debut Lost River. Smith's directorial debut, the short film Cargese, was aired on Sky Arts in May 2013. Smith had a supporting role, as the embodiment of Skynet, in Terminator Genisys (2015); he was set to have more screen time in the sixth and seventh films in the series. On 20 November 2014, it was announced that Smith will star in the action-thriller film Patient Zero. On 28 August 2018, he was reportedly cast in Star Wars Episode IX, but he later denied his involvement. In January 2019, Smith joined Jared Leto's in Sony���s ‘Spider-Man’ spinoff ‘Morbius’. During Smith's tenure in On the Shore of the Wide World, the play transferred to the Royal National Theatre in London. After finishing the play, he took on the role of Lockwood, a pupil in the Alan Bennett play The History Boys. After The History Boys, he acted in the teen play Burn/Chatroom/Citizenship and with Christian Slater in Swimming with Sharks, the latter being his West End début. In 2007, Smith appeared as Henry in the Polly Stenham play That Face at the Royal Court Theatre Upstairs in Chelsea. The play transferred to the Duke of York's Theatre in the West End in 2008 and became Smith's second role there. That Face focuses primarily upon alcohol and drug addiction in an upper-middle-class family after the paternal figure in the family leaves. As Henry, Smith portrayed an aspiring artist who left school to take care of his mother. To prepare for the role, the cast interviewed alcoholics and their families. Smith discussed his character's relationship with his mother in a May 2008 interview with the Evening Standard. The entire cast of the play was nominated for the 2008 Laurence Olivier Award for Outstanding Achievement in an Affiliate Theatre, and Smith won the Evening Standard's award for "best newcomer" for his role. Upon its transfer to the West End, Smith's performance as Henry was highlighted as one of the positive aspects of the play by critics for the Evening Standard, Daily Express, The Guardian, and The Times. On 7 October 2013, it was announced Smith would portray Patrick Bateman in the musical adaption of American Psycho at London's Almeida Theatre. The show began its run in December 2013. Smith is an atheist and an avid supporter of Blackburn Rovers F.C.. He has cited his favourite band, Radiohead, as an inspiration, and has referred to Oasis as "the greatest rock-and-roll band in the world." In 2015, Smith was named one of GQ's 50 Best-Dressed British Men. ^ "Who on earth is Matt Smith?". BBC News. 3 January 2009. Retrieved 16 March 2009. ^ a b c d e Hoggard, Liz (6 May 2008). "That face to watch". This is London. Archived from the original on 23 January 2009. Retrieved 16 March 2009. ^ "Doctor Who – The End Of Time, Part Two". BBC Press Office. Retrieved 30 April 2010. ^ "Matt Smith announces he is to leave Doctor Who". BBC Blogs. 1 July 2013. Retrieved 3 August 2013. ^ Han, Angie (3 July 2015). "'Terminator: Genisys': What's the Deal With Matt Smith's Character?". /Film. ^ O'Connell, Sean (2016). "Will Terminator Genisys Even Get A Sequel?". Cinemablend. ^ Singh, Anita (19 August 2015). "£100m Netflix series recreates royal wedding". The Daily Telegraph. Archived from the original on 22 March 2016. Retrieved 13 December 2016. ^ "Matt Smith – 11th Dr Who – Former NSB Head Boy". Northampton School for Boys. Archived from the original on 14 October 2013. Retrieved 26 March 2013. ^ Irvine, Chris (6 January 2009). "Late bets on Matt Smith as Doctor Who came from home town". The Daily Telegraph. ^ Davis, Johnny (25 October 2010). "Actor: Matt Smith – GQ Men Of The Year 2010". GQ. ^ "Meet the Eleventh Doctor". Doctor Who microsite. BBC. 5 January 2009. ^ a b c d e Young, Kirsty (4 March 2018). "Matt Smith". Desert Island Discs. BBC. Radio 4. Retrieved 5 March 2018. ^ "Doctor Who: The Eleventh Hour for UEA's Matt Smith". BBC News. 6 April 2010. ^ a b Shenton, Mark (18 October 2007). "Fresh Face: Matt Smith". Broadway.com in London. Archived from the original on 30 March 2009. Retrieved 3 January 2009. ^ O'hara, Helen (3 January 2009). "Matt Smith Is New Doctor Who". Empire Online. Retrieved 3 January 2009. ^ "Danny Foster". Party Animals microsite. BBC. Retrieved 3 January 2009. ^ "Matt Smith interview". Party Animals microsite. BBC. Retrieved 4 January 2009. ^ a b "Matt Smith is the New Doctor". BBC Press Office. 3 January 2009. Retrieved 3 January 2009. ^ a b c d e "The Eleventh Doctor". Doctor Who Confidential. Series 4. Episode 15. 3 January 2009. BBC. BBC One. ^ "David Tennant quits as Doctor Who". BBC News. 29 October 2008. Retrieved 3 January 2009. ^ "Doctor Who: The runners and the riders". BBC News. 3 January 2009. Retrieved 3 January 2009. ^ Hilton, Matt (3 January 2009). "Odds on Who". The Doctor Who News Page. Outpost Gallifrey. Retrieved 5 January 2009. ^ Goldsmith, Belinda (4 January 2009). "Dr Who? BBC chooses newcomer". Reuters. Retrieved 4 January 2009. ^ Moreton, Cole (4 January 2009). "Doctor Who? Unknown is latest incarnation of Time Lord". The Independent. London. Retrieved 5 January 2009. ^ French, Dan (4 February 2010). "Matt Smith rejected for BBC's 'Sherlock'". Digital Spy. Retrieved 4 February 2010. ^ "Matt Smith to return for new Doctor Who series". BBC News. 8 July 2011. Retrieved 8 September 2011. ^ "The Doctor and Jo Grant join CBBC's The Sarah Jane Adventures in special episodes written by Russell T Davies". BBC Press Office. 19 April 2010. Retrieved 19 April 2010. ^ "Doctor Who star Matt Smith to appear in Sarah Jane Adventures". The Daily Telegraph. London. 19 April 2010. ^ Moss, Lyndsay (5 January 2009). "Doctor who? Newcomer divides programme's fans". The Scotsman. Retrieved 5 January 2009. ^ "National TV Awards winners". BBC News. 26 January 2011. Retrieved 8 September 2011. ^ "Eleventh Doctor Matt Smith". geek.com. Geek.com. ^ Lee, Ann (28 June 2010). "Doctor Who's Matt Smith performs with Orbital at Glastonbury". Metro. Retrieved 26 March 2013. ^ "Doctor Who's day at the Proms". BBC News. 25 July 2010. Retrieved 25 July 2010. ^ "Doctor Who's Matt Smith on Olympic torch run". BBC News Online. 26 May 2012. Retrieved 26 May 2012. ^ Duffin, Claire (1 June 2013). "Matt Smith to quit Doctor Who after Christmas special". The Daily Telegraph. Retrieved 1 June 2013. ^ Jeffery, Morgan (7 October 2016). "Matt Smith wishes he'd stayed on Doctor Who for longer". Digital Spy. Retrieved 12 December 2017. ^ Sandberg, Bryn Elise (18 June 2015). "John Lithgow, Matt Smith Cast in Netflix's 'The Crown'". The Hollywood Reporter. ^ Miller, Liz Shannon (9 December 2017). "'The Crown': Matt Smith Knows If The Royal Family Has Seen The Netflix Drama, But Doesn't Know How It Will Handle Trump". IndieWire. ^ O'hara, Helen (12 February 2016). "Matt Smith talks Pride And Prejudice And Zombies and Doctor Who". Empire. Retrieved 7 May 2017. ^ Meza, Ed (9 February 2009). "Eva Green to star in "Womb"". Variety. Retrieved 12 March 2009. ^ Wales, George. "Matt Smith to star in Ryan Gosling's How To Catch A Monster". TotalFilm.com. Retrieved 26 March 2013. ^ Hollingshead, Iain (30 May 2013). "Cargese, Sky Arts 1, review". The Daily Telegraph. Retrieved 12 October 2013. ^ Friedlander, Whitney (2 May 2014). "'Doctor Who's' Matt Smith Joins 'Terminator' Reboot". Variety. Retrieved 4 May 2014. ^ Reynolds, Simon (2 May 2014). "Doctor Who's Matt Smith cast in Terminator 5, role expands in sequels". Digital Spy. Retrieved 4 May 2014. ^ Hall, Gina (20 November 2014). "'Doctor Who's' Matt Smith to Star in 'Patient Zero'". TheWrap. Retrieved 13 March 2015. "Doctor Who" alum Matt Smith will star in "Patient Zero", a Sony spokesperson told TheWrap. ^ D'Alessandro, Anthony (28 August 2018). "'Star Wars: Episode IX' Taps 'Doctor Who' Alum Matt Smith". Deadline Hollywood. Retrieved 28 August 2018. ^ Howard, Kirsten; Saavedra, John (7 March 2019). "Star Wars: Episode IX - Matt Smith Isn't in the Movie". Den of Geek. Retrieved 8 March 2019. ^ Kroll, Justin; Kroll, Justin (24 January 2019). "Matt Smith to Star With Jared Leto in Marvel Spinoff 'Morbius' (EXCLUSIVE)". Retrieved 23 February 2019. ^ "Olivier awards 2008: nominations in full". The Guardian. London. 7 February 2008. Retrieved 3 January 2009. ^ "An Exclusive Chat With Matt Smith". BBC. Retrieved 28 January 2015. ^ Rynn, Melissa; Jackson, Kate; et al. (12 May 2008). "Review Round-up: Stenham Saves West End Face". What's on Stage. Archived from the original on 16 June 2011. Retrieved 18 April 2009. ^ Wyatt, Daisy (7 October 2013). "Matt Smith lands role as Patrick Bateman in American Psycho musical". The Independent. Retrieved 7 October 2013. ^ Ferguson, Euan (3 December 2011). "Matt Smith interview: lord of misrule". The Guardian. ^ "Doctor Who actor Matt Smith: Blackburn Rovers run by numpties". BBC Sport. 19 March 2013. Retrieved 12 September 2014. ^ "Football treat for Doctor Who star". MSN TV. 26 June 2010. Archived from the original on 28 June 2010. Retrieved 12 September 2014. ^ "Matt Smith". Official London Theatre. 14 May 2008. Retrieved 30 October 2017. ^ Lesnick, Silas (2 July 2015). "Matt Smith's Terminator Genisys Character Explained". ComingSoon.net. ^ Kelly, Stephen (21 November 2013). "Doctor Who star makes surprise cameo in An Adventure in Space and Time". Radio Times. Retrieved 1 October 2018. ^ Billington, Michael (10 July 2016). "Unreachable review – Matt Smith searches for the magic hour". The Guardian. ^ Seale, Jack (9 April 2013). "Cargese directed by Doctor Who's Matt Smith". Radio Times. ^ Douglas, Torin (16 February 2017). "Awards 2017 – Television nominations". Broadcasting Press Guild. Retrieved 24 April 2017. ^ Douglas, Torin (17 March 2017). "The Night Manager, The Crown, Planet Earth II and Desert Island Discs take top prizes at 43rd Broadcasting Press Guild Awards". Broadcasting Press Guild. Retrieved 24 April 2017. Smith, Oli (2010). Doctor Who: The Eleventh Doctor: Matt Smith. London: BBC Children's Books. ISBN 978-1-4059-0687-6.